I couldn't resist being among the first to try Sansho, the new Asian fusion restaurant created by Paul Day. I had to test the talents of the former senior sous chef at the Michelin-starred Nobu in London. He also worked at Nahm, the only Thai restaurant in Europe to receive such a star. Although I'd never tried it, I had heard good things about Day's work at Shiso, located in the member's only LS Club (which has morphed into the Crystal Club). I also went because I'd gotten a recommendation from "Red" on my Czech Please Facebook page. Let's just say expectations were pretty high. And as I'll explain later, something unexpected happened that perhaps I should have expected. 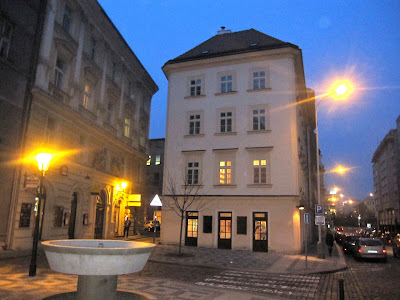 Twice, I made my way over to Petrská Street. The brightly lit restaurant stands tall on its own corner. 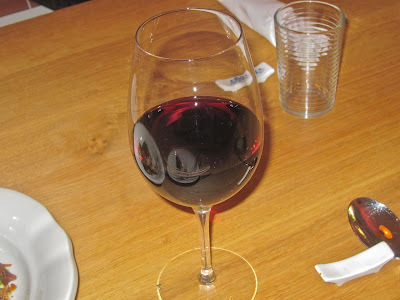 I went once alone on a quiet weeknight, and once with my Italian foodie friend, Miss P. Both times, it was still in the soft open period and the menu had not been finalized. 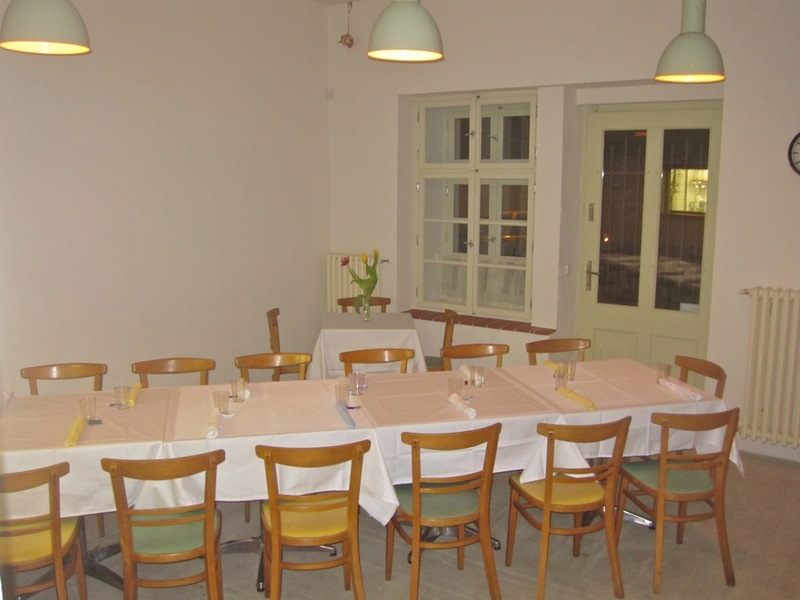 The L-shaped main dining area is meticulously simple. It feels in the kitchen of someone's stylishly spare country house. The front room is furnished with long, blond wood tables with cushioned bench seating. I liked the casual, communal feel. Miss P pointed out that sitting for a long meal without back support is not terribly comfortable and she wished for placemats or some covering for the table. I was told the restaurant, which has a no smoking policy, can seat 40 people, but it would be tight. In warm weather, there will be seating for 25 more on the beautiful street out front. Several friends have already been to Sansho and raved about it. There were just a few nitpicks about the seating: Mr. T wished he could adjust the distance of the bench to the table more easily. Mr. B said he liked the atmosphere, but felt awkward sitting elbow to elbow with an overly amorous couple. Bad luck. Of course, there's also every chance you might meet some interesting new people at your table. I had an issue with high noise levels when the restaurant was full on my second visit. It occasionally put a strain on conversation. I always find it entertaining to watch cooks at work. The kitchen is not fully open, but there's a large window to the kitchen where you can catch glimpses of the owner and several other cooks hard at work. 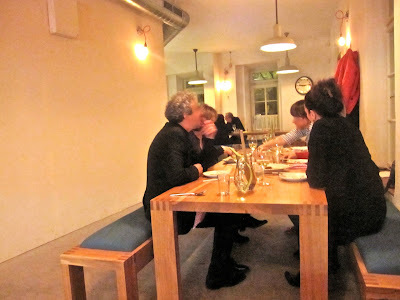 I learned on Cuketka's blog (Czech only) that Sofia Smith of Angel Restaurant fame (which I loved) was working there. 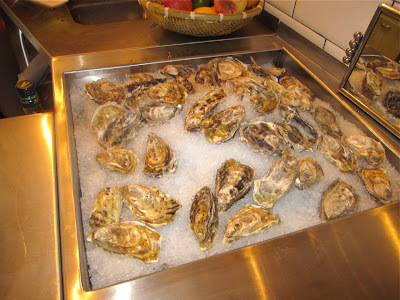 In the front, there's a bar area where oysters were kept on a bed of crushed ice. Eventually there will be photos or art on the walls. A sound system had yet to be installed. Some light fixtures consisted of industrial-looking Bakelite hubs with red wires and low-wattage bare bulbs. I asked Chef Paul what he would cover those with, thinking it was unfinished. I was wrong. He told me that was exactly how he wanted it. There is a small room in the back with just five or six simple tables that can be pushed together if necessary and small, separate chairs. To the untrained eye, these might look like old schoolroom chairs. And basically they are. Day said he imported them from Britain because he liked their unfussy, frugal simplicity. He was later informed that he had actually repatriated old Czechoslovak-made chairs someone remembered sitting on at school many years ago. Overall, the impression, entirely intentional, is that the investment is in the food, not the furniture. 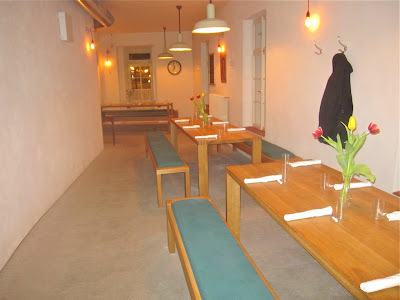 On the first visit, the chef offered basically a seven course tasting menu of everything he was making that night for 750 CZK. 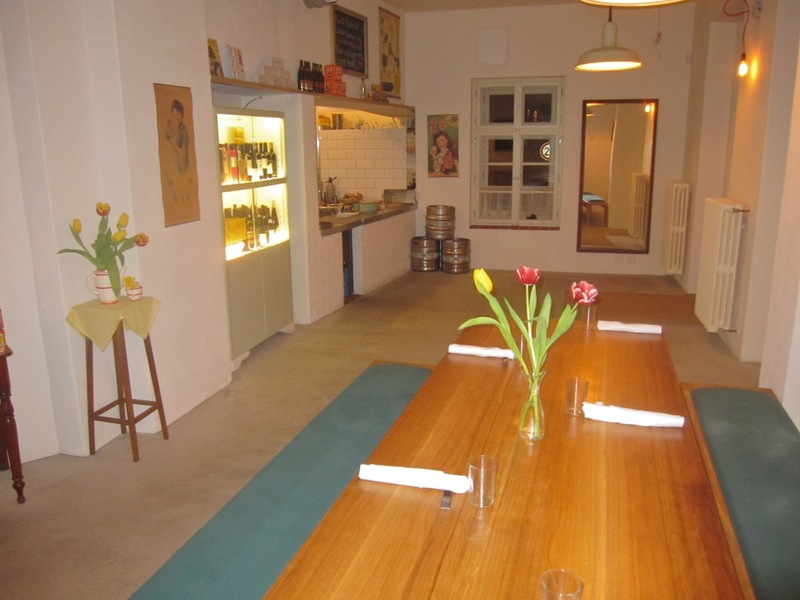 He said that he aims to keep prices for bigger main courses under 400 CZK. 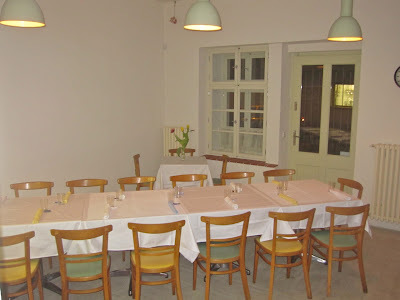 I saw the lunch menu and most plates were well under 200 CZK. On the second visit, there was still no menu, so I'll list the prices as they were itemized on the receipt. As I saw with many other guests, food that is ordered by several people is served family-style, with everyone sharing from a big central plate or bowl. A first pleasant surprise is that Sansho serves pitchers of iced tap water, rather than pushing the pricey bottle stuff (which they have as well). There was a nice twist, though, with cucumber and mint, giving it a fresh and fragrant flair. There was a 10 CZK water charge per person. 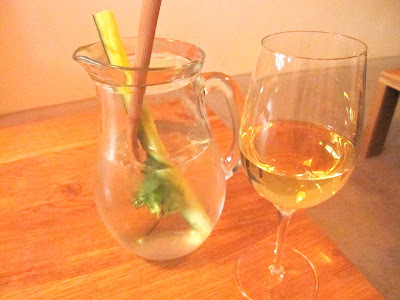 Miss P and I decided to start with white wine and shared a .15 liter glass of Sardinian Vermentino (115 CZK). It was tart with a light sweetness. Mr. B had told me how much he enjoyed it. The first course was oysters. The bivalves came from France. They were meaty, absolutely fresh, and delicious. There were two different preparations. 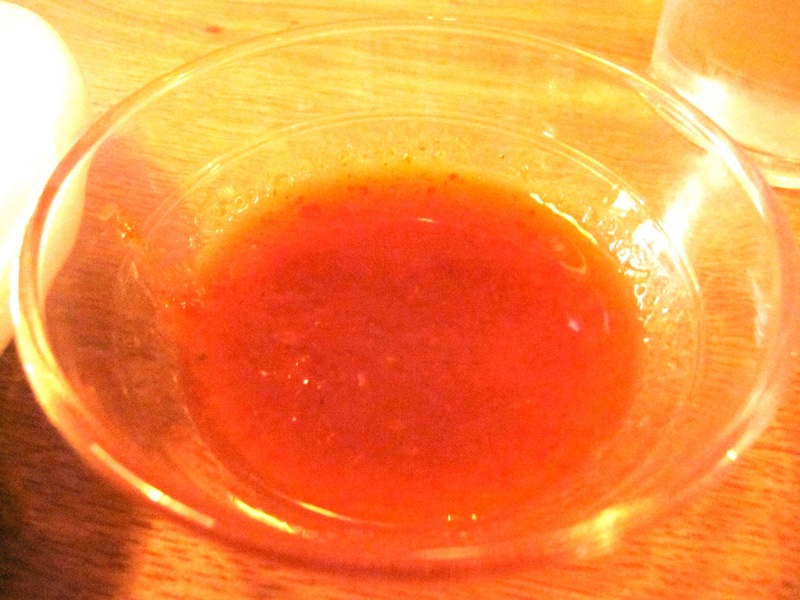 The small, kitschy glasses held a Thai Nam Jin sauce (144 CZK for 2). Chef Paul called it his version of Bloody Mary oysters, though there was no vodka. To put the flavor in simple terms, it was like spicy tomato juice with the refreshing taste of the sea. 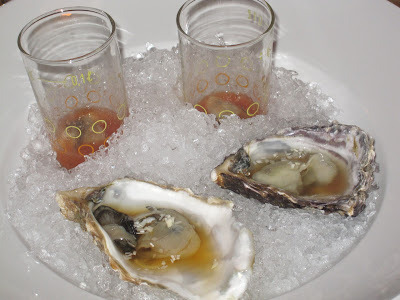 The oysters still in the shells had a simple orange ponzu sauce (144 CZK for 2). To me, the oysters were really the stars here, more than the sauces. 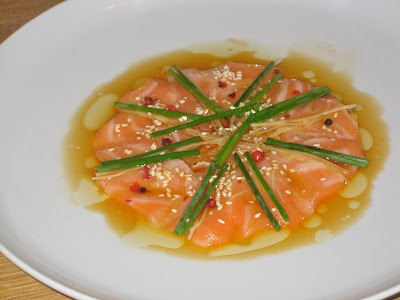 Next came the seared Scottish salmon sashimi (180 CZK). The fish was covered with a citrus soy sauce, fresh ginger, and sesame seeds. It was another refreshing and light plate that continued to wake up the palate. Then we received two sticks with chicken satay (120 CZK). The tender meat was expertly grilled. The nutty sauce was more salty than sweet. It was topped with crispy fried shallots. 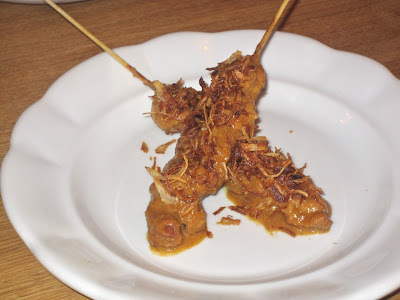 It didn't grab me as much the satay sauces I've fallen in love with at Indonesian restaurants in Amsterdam. Mr. B told me he thought it was nice but not the best dish among many other very good ones. Chef Paul came by to explain that he had prepared a dish he called "fritto misto" but with an Asian turn (130 CZK). It included one of my all-time favorites, soft shell crab, a rarity in Prague. The little legs were expertly coated with the lightest of tempura-style batter. There were a few delicious whitebait under there. 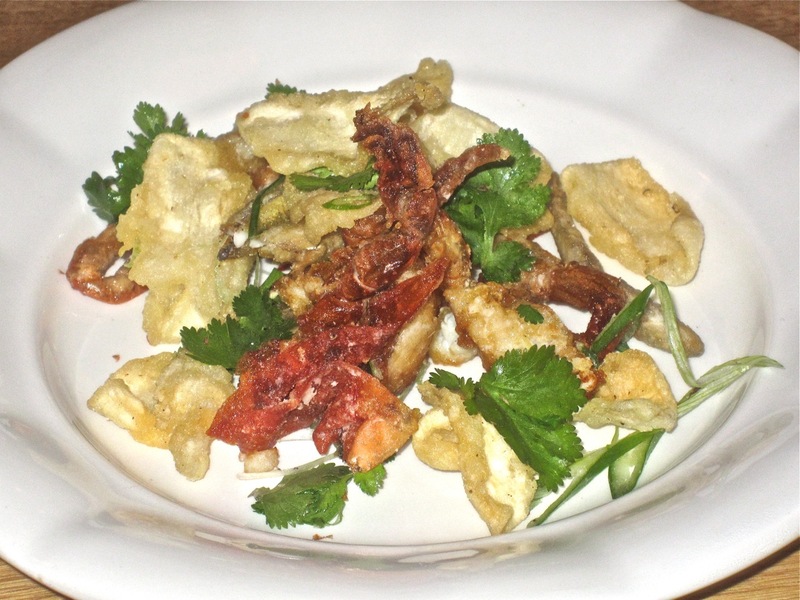 There were also small pieces of batter-fried squid. Of the trio, this worked the least best. They were rather insubstantial. The whole thing was topped by cilantro, also known around these parts as coriander. It's probably my favorite herb. On the side was a Thai chili sauce that didn't look like the usual stuff from a bottle you see everywhere else. This was homemade. It was sweet, spicy, and tangy, and a nice extra quality detail. There was a dish called duck sliders (120 CZK). The excellently executed shredded duck with great skin sat on a round, fluffy Chinese-style bun. There was also a homemade plum sauce, hoisin, green onion and cucumber. It looked like it would be doughy mouthful. But I was delightfully surprised. The bun was very light and all too easy to consume. The slider went down in three quick bites. We tried .15 liter glasses of the Grotta Rossa (100 CZK each). I liked it, but Miss P also felt it was just simple. On my solo visit, I got to try his pork belly in a 3 pepper sauce. Some years back, I tried the pork belly at Maze by Gordon Ramsay while it was open in Prague. Without a doubt, Paul Day's was far better. By its very nature, this is a very fatty dish. I urge you to ignore this fact. It was a pure pleasure. Each bite melted in my mouth. It spoke to me of China. I was told some of the secrets to its success. The pork belly was brined for hours before cooking. 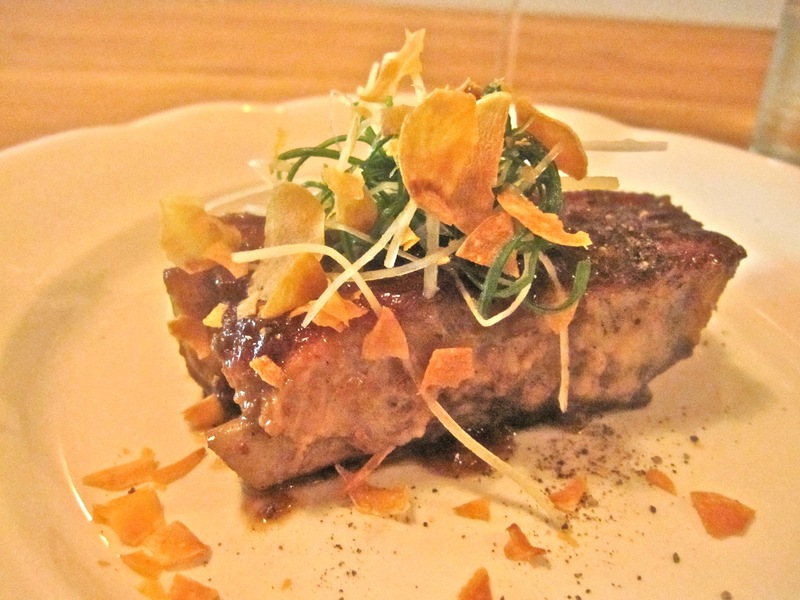 Also, all the pork and beef Sansho served are sourced from dedicated organic farms. 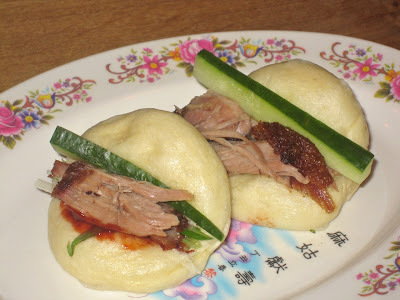 The flavors reminded me of meals I'd had last fall on Gerard Street in London's Chinatown. I mentioned this to Chef Paul and he told me he'd worked for a time as a butcher there. His experience, and the taste, certainly come through. On the second visit, I was shown a piece of fresh fish, an umbrina. I was told it was from the haike family and had been swimming in the waters off Italy only the day before. It was later steamed and cooked with chicken stock, black bean, and white pepper (310 CZK). Chef Paul was very proud of this fish, so he looked crestfallen when I wasn't terribly enthusiastic about it. 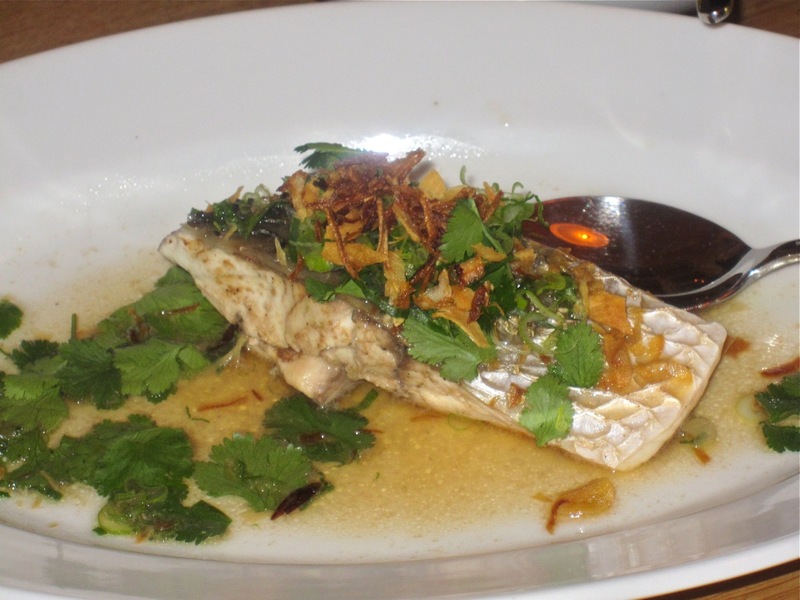 Perhaps it is just my personal taste, but I tend to prefer lighter fish like sea bass, sole, or cod. This boneless filet had a much denser texture and somewhat fishier flavor that didn't appeal to me. Miss P also didn't love it. However, I am enthusiastic about the beef rendang. This Indonesian dish was great. The meat was cooked for 12 hours until it reached a state of fork-tender softness. Crispy toasted coconut was sprinkled on top. It sat under a spicy, coconut milk-based sauce. On the side were homemade roti. After the many other dishes I had that first night, it almost killed me to finish it. So yes, it is to die for. 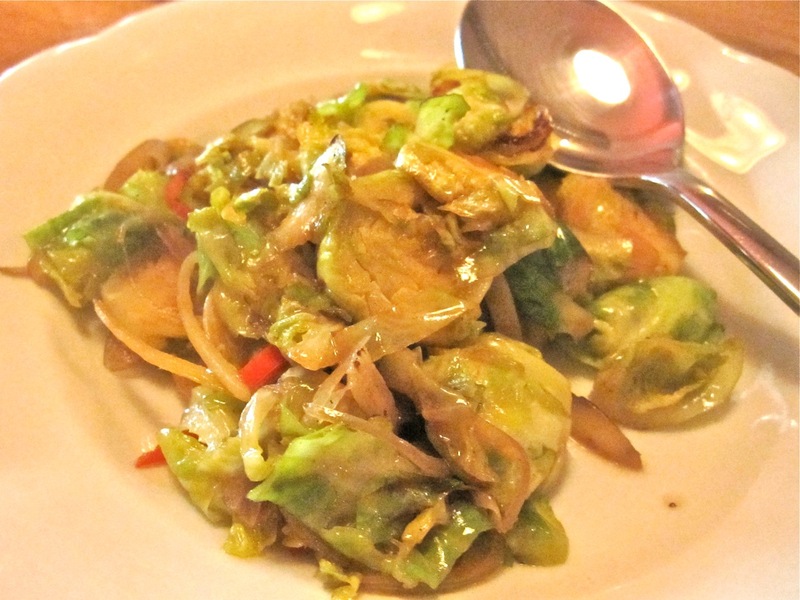 There was a side dish of wok-fried Brussels sprouts. Very nice, and again, I was having Gerard Street flashbacks. It was fried up with fish sauce, ginger, and chilies. My favorite dish of all came on the second visit. It was the boneless barbecued pork chop. The sweet sauced meat had a little char on it that gave it the smoky flavor I so often crave. 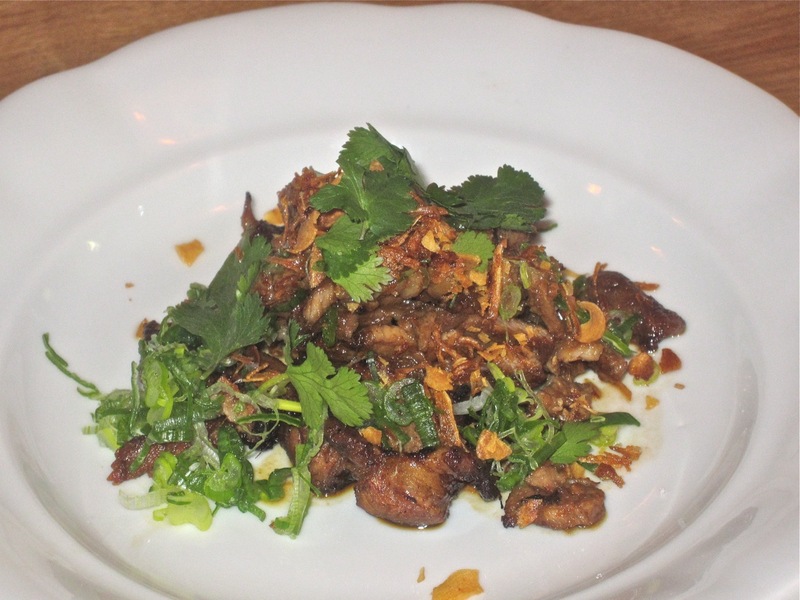 It was cooked with galangal, lemon grass, and fish sauce and topped with cilantro. I'll get a double portion of this next time. Miss P also liked this one the best. When you eat yourself to the point of a Monty Pythonesque explosion, the heavenly desserts are the way you want to go out. First, I tried the homemade ice cream (120 CZK). 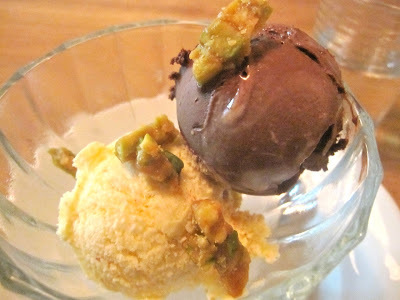 On this day, there was chocolate, passion fruit with pink peppercorn, and crunchy bits of pistachio toffee. The chocolate was incredible. I couldn't decide if it was like a dense chocolate mousse or a light flourless chocolate cake. The flavor of bittersweet chocolate was intense. Death by chocolate, indeed. The acidic passion fruit was the perfect palate cleanser. 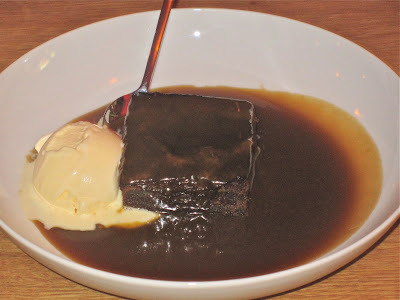 On the second visit, I had the sticky toffee pudding (135 CZK). It was very much like the great one that Sofia Smith made at Angel. Served warm with vanilla ice cream, this caramelized confection was a super rich finish. I must warn you, it does require a sweet tooth of saber-toothed tiger proportions to consume this dessert. Now it's time to tell you about my unexpected experience. Although it has already gotten busy by word of mouth, the first night I went, I was alone and there was only one other table occupied. I stuck out like a sore thumb. Chef Paul struck up a conversation with me. He sat down at my table. We talked at length, and he satisfied my endless curiosity on many topics. I really do love talking about food, as does he, and my guard was down. At the end of the conversation he said, "And by the way, I read your blog." Czech Please! Busted! I'd been recognized a few times after an article was published, but it had never happened in the middle. At that point, I just said I'd have to make full disclosure and let the chips fall where they may. This was a restaurant I had to write about, no matter what. Did I get special treatment and attention? Maybe. Was I too nice or too hard because of it? I hope not. 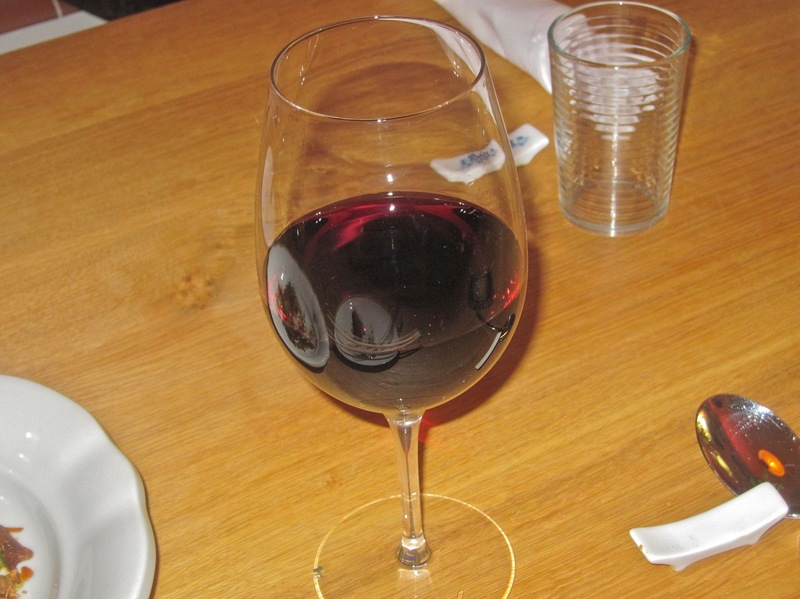 Was a drink and the pork chop dish left off the bill by mistake? I hope so. All I can say is that I did my best to report my honest impressions. However, if that is not quite enough, I also have the independent views of those friends and acquaintances who have already eaten at Sansho. One of them is Grant Podelco, the polymorphous Prague blogger. He's the author of the Gusto blog, among other many things. I saw him through the window one night as I passed by having dinner with his wife and friends. He later told me it was "one of the best dinners of my life, and certainly the best meal I've had in Prague." High praise, indeed, from a former restaurant critic. Mr. B texted me at the end of his dinner. The message said: "Am at nonfancy fusion place. Outstanding; einmalig (unique) in Prague." Mr. T gave it a big thumbs up. The only dissenting voice was Miss P, who was not nearly so impressed. It's not necessarily a cheap meal. If you eat and drink as much as I did with Miss P, you could hit 1000 CZK per person. But you could certainly eat and spend less. Either way, I'd still say it's a great value. You could really taste the time and attention to detail that was put into each dish. I'm putting Sansho on my recommended list for friends and visitors. Mr. B is right -- there's nothing else quite like it in the Czech capital. That's because Paul Day, like William Shatner's alter ego, Captain Kirk, is a man with a mission. And that is to boldly go where no chef has gone before. I met Paul through a common friend when he was putting together his restaurant. We didn't talk much that day, but I fancied him a nice bloke. A couple of weeks later I stopped for a beer at the Jama Grill. I didn't know at the time where the restaurant was. He saw me sitting by the window and came out to invite me to the place. He0 gave me a "tour" of the place and introduced me to some of his staff. I ran into him the other day, again at JG. He and Sofia were having a beer at the bar. We had the chance to talk a bit more at length and my initial impression was reinforced. Nice bloke. I still owe a visit to the restaurant, but it is great to see that it's good. PS: You were mentioned, BTW. He also said that a magazine had sent someone for a review and confessed his surprise at how soon restaurants get reviewed here. A sense of scale as to the size of the dishes would be useful. Are these dishes huge or tiny? Sansho, Shiso (and Nobu), why all these Japanese names when there is nothing that reminds me of Japan from the photos (I am Japanese)? Dining rooms awfully simple but not the Japanese simple, food presentation not pretty (you know how the Japanese are fussy about the presentaion). Guess it's mostly South east asian/thai, but then why a Japanese name, I just wonder. If the place is a success, the food must be good. 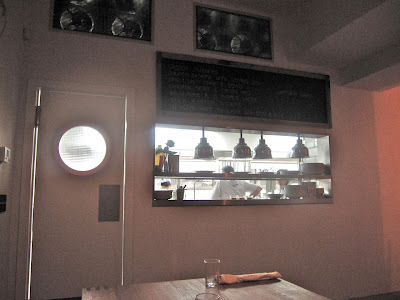 I decided to read this entry again following my first visit to Sansho a couple weeks ago. While the quality we enjoyed was as reported, the portions you were given appear large compared with my own experience. The 180kc salmon sashimi, 120kc satay and 130kc fritto misto resembled the portions my wife and I shared between two people as part of our 750kc per person dinner. We were given just one slider each while a regular portion seems to include 2 (amounting to only 60kc each). A quick calculation shows we'll save a lot by ordering a la carte next time. Hmmm. 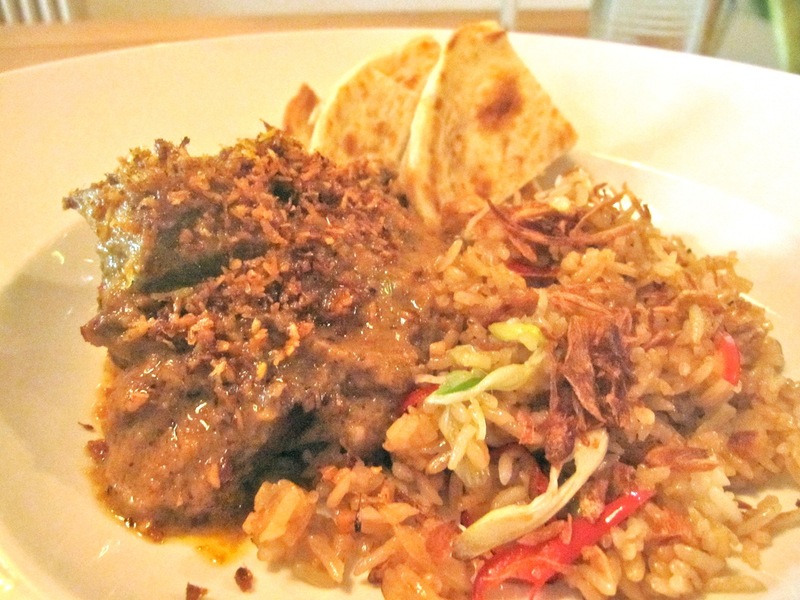 Except for the beef rendang, I wouldn't consider the portions large. When I went with a guest, we had one slider each. Of course, that was the first month -- maybe it has changed a bit, but the pix do lack perspective. Last time I was there, I asked to order a la carte and Paul Day basically insisted we have the set menu. Do they even do a la carte now?